Mr. Alexander does it again, with help from Ms. Hess; I truly love the books this man creates. Blade is the son of an aging rock star who reacted to the death of Blade's mom with an everlasting and highly dysfunctional descent into addiction and absentee parenting. As the story unfolds, Blade deals with his high school graduation, his father's inability to stay sober, his sister's delusions of grandeur, a broken heart, and a recent revelation he is adopted, by escaping to Ghana to find the birth mother he didn't even know he missed. 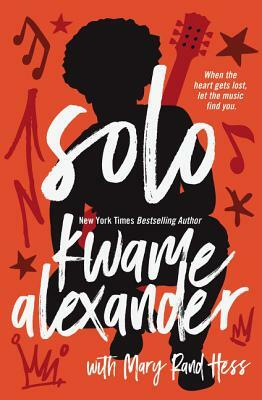 This is a terrific tale of music, maturing, love, adoption, and finding your way, told in Mr. Alexander's usual sparse, but effecting poetic style (with an added bonus of a great soundtrack list). Blade never asked for a life of the rich and famous. In fact, he'd give anything not to be the son of Rutherford Morrison, a washed-up rock star and drug addict with delusions of a comeback. Or to no longer be part of a family known most for lost potential, failure, and tragedy, including the loss of his mother. The one true light is his girlfriend, Chapel, but her parents have forbidden their relationship, assuming Blade will become just like his father. In reality, the only thing Blade and Rutherford have in common is the music that lives inside them. And songwriting is all Blade has left after Rutherford, while drunk, crashes his high school graduation speech and effectively rips Chapel away forever. But when a long-held family secret comes to light, the music disappears. In its place is a letter, one that could bring Blade the freedom and love he's been searching for, or leave him feeling even more adrift.